John XXIII and John Paul II, the Popes who tore down walls Pope Francis, how will he defend a Church under attack? In his last meeting with Roman clergy, Benedict XVI spoke about a «Second Vatican Council of the media and a real Second Vatican Council,» complaining that the media wanted to set the agenda of the Conciliar fathers. Nowadays something similar is happening again, with respect to Pope Francis’ papacy. One could speak about a papacy according to the media and a real papacy. On one side, there is Pope Francis, who has carried on the mission of the Church, even having as a secret and trusted advisor Pope Emeritus Benedict XVI. On the other hand, there stands Pope Francis’ pontificate as the media has portrayed it. A media exploiting every information gap to construct an image of the pontificate which goes far beyond anything that Francis has said or done. The media’s agenda for the Church is mostly focused on two topics: the issue of divorced and remarried, and the Curia reform. To have the media set the agenda of Pope Francis is paradoxical, since he does not want anybody to manage his personal schedule. His two secretaries must be, in his view, invisible, and in fact neither of them is a full-time secretary. Pope Francis personally manages most of his appointments, trying not to disappoint anyone (some of the meetings are less than five minutes long) and he places himself his phone calls. Obviously, all of the Pope’s private activity cannot be considered part of his magisterium. But, since it’s the Pope doing it, every gesture, every word uttered in private, can have many consequences. Recently, news came out from Argentina that Pope Francis had spoken with a woman married with a divorced and remarried man. The woman wrote to the Pope complaining that she could not take the Holy Communion. The Pope reportedly phoned her back some months later, and would have said that «there are priests more Papist than the Pope» and advised her to go to another parish to take Communion. Actually, the story’s details changed from one media to another as it was reported. The news broke out in Argentina, were a local radio and TV broadcaster picked it up from a Facebook posting by the woman’s husband. The story was then picked-up by the Argentinean press agency Telman, ricocheted to Italian outlets and after that to an English prominent newspaper, and thus disseminated all over the world. The Holy See responded to the media reports with a short press release, underscoring that none of the Pope’s private activities «form part of the Pope’s magisterium.» Reports in the preceding days (i.e. treating these activities otherwise) had created a lot of confusion. All true. It seems evident that there is an agenda to change the praxis of the Church on issues like that of communion for the divorced and remarried. The outcomes of the next two synods of bishops (the extraordinary synod of 2014 and the ordinary synod of 2015) which will deal with family issues are awaited with a great deal of anticipation. Pope Francis will not take a stance before these two meetings take place. Everybody is eager to know what is that he will decide. Many expectations have been placed on Pope Francis’ pontificate. Pope Francis had been described as the man to break with the past in order to carry the Church into modernity. He was (and still is) defined in opposition to Benedict XVI. As if the Church would have started to change under Pope’s Francis pontificate. In fact, the Church has not changed. The truths of the faith have remained the same. Perhaps, the only thing that has changed is the approach. And it is mostly a matter of style. Pope Francis is practicing an informal Papacy. The phone calls he constantly makes, the unscheduled interviews he keeps granting (the most recent one with a bishop who went to visit the Pope for an ad limina visit, and who then broadcasted the content of his conversation on a Chilean television station) are to be considered as the pastoral visits of a Pope who cannot leave the Vatican as often as he would like to. However, making public the content of phone calls and meetings without proper oversight of the message in advance, or a heads-up to the Vatican communications offices, has its perils. The greatest risk is having Pope Francis’ words manipulated. Pope Francis loves to speak in broad terms, leaving the discussions open: it is part of his style. It is said that the then cardinal Jorge Mario Bergoglio strongly opposed the gay marriage law in Argentina. But sources from Argentina maintain that he actually did not want to take a strong stand. The members of the Conference of Bishops of Argentina had to convince him that, as president of the Conference, he had to take a strong stand. So he signed a declaration, but he never addressed the issue in his preaching and public remarks. His position above all is that of «a son of the Church,» as he put it to journalists in the press conference in the plane coming back from the World Youth Day in Rio de Janeiro. The Pope’s words seem to indicate that he will not change the doctrine for what concerns the divorced and remarried. Rather, he wants to signal his proximity to those, divorced and remarried, who are ostracized in the Church. Pope Francis has seen parishioners stupefied by divorced and remarried people in their communities attending mass –even if not taking Communion. He feels that there is a widespread view that the divorced and remarried should not even go to church. Pope Francis wants to underline that the divorced and remarried, even if they cannot take Communion, must not be marginalized from life of the Church. To the contrary, they must be included. This pastoral approach is the model that Pope Francis wants to give to the Church. An inclusive approach, going to the encounter of everyone. Even lifting up the role of laymen and – why not – women in the ranks of the Church. Reviewing the role of laymen in the life of the Church is something widely speculated about, in the context of discussions about a possible Curia reform. As was the case with the issue of the divorced and remarried, discussion about the Curia reform are also at risk of following an agenda set by the media. 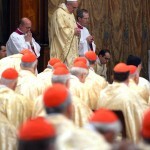 The Council of Eight Cardinals will meet April 28 to 30. On the table there are several drafts of proposals to streamline the Vatican dicasteries and to improve the organization of the Curia. The aim is to enhance productivity. There is also the notion of establishing a new Congregation, to be called “Congregatio de Populo Dei” (Congregation for the People of God), which would encompass the pontifical councils for Family, the Laity, and for Health Pastoral Care. The new Congregation should be comprised of four offices: young people, women, family and pastoral health care. The heads of these offices should be prominent laymen and women. In fact, prominent laymen are already in high-rank posts in the Holy See, working side by side with members of the clergy. This is nothing new. 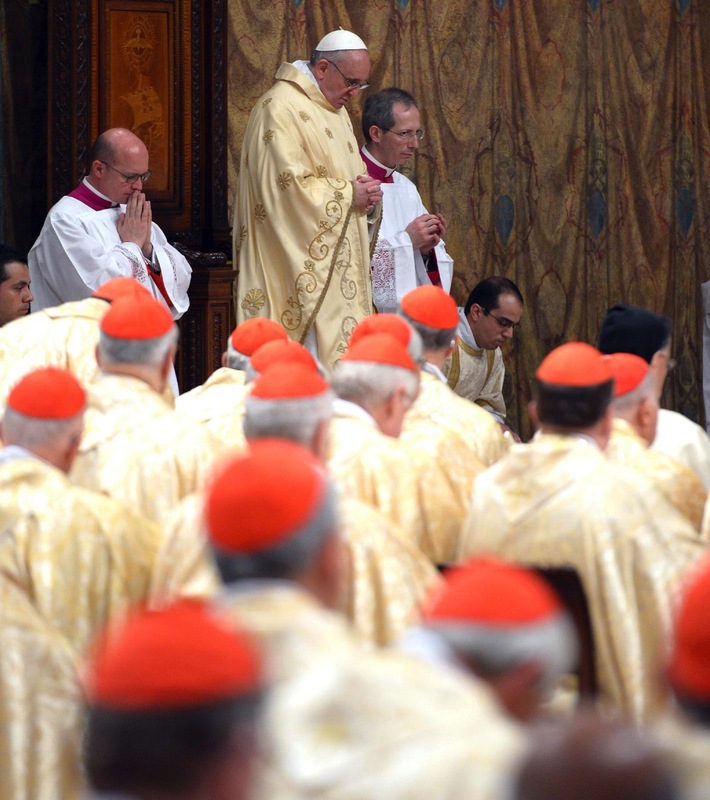 If news and proposals about it on the cardinals’ table are leaked, it is an indication that that someone wants to push an agenda for the Curia reform. As Pope Francis continues with his pastoral care, public and at the same time independent, out there is a world aiming at prescribing how to modernize and reform the Church. Ultimately, Pope Francis informality allows many to hide behind the ‘mens papalis’ (the Pope’s will) to push for some changes to the doctrine of the Church. While the media pushes for reform, Pope Francis has shown he is no revolutionary: the Institute for Religious Works (the so-called Vatican bank) is still there, and almost all the heads of the Vatican dicasteries were kept in their posts. The Pope merely reshuffled the membership of a few congregations. It was widely thought that Pope Francis would downplay ecclesiastical honorifics. But Pope Francis did not follow this path, and even made Monsignor Fabio Fabene –the new number two of the general secretariat of the synod– a bishop. The number of departments is growing (it is thought that ultimately Pope Francis will establish four different Secretariats to help him run the Church), but perhaps the central government of the Church has suffered in the process. When John Paul II went off to the peripheries, there were people like Joseph Ratzinger, Paul Poupard, and Roger Etchegaray to run the Curia machine and to watch that every word uttered by the Pope was properly reported and their meaning well understood. Nowadays, who constitutes Pope Francis’ rearguard? And will they be able to break loose from the Papacy according to media, to project the real Papacy? 4 Responses to Pope Francis: Is the papacy according to the media overshadowing the real papacy? You mean Third Vatican Council. Dear Andrea:I agree “in totum” with your commentary, but you must consider that Poew Francis is a Jesuit, that is He knows how the real things functions.He has the Order experience:He was retired from beiing the “Capo” in Argentina, and the necessity of be adapted to the reallity he lives, and He did.He need to do a new face to the church,but He did not clearly…you will remember my ask aboutr de la Rica…Bertone that was more easy to do….But the media is not really “catholic” as you know,with exceptions as you and others.I think that we must be very patient a prayer for give Him the time to do the things.Will have a great proof in Israel. I continue reading your Monday Vatican.I like it very much,and your work must be very difficult in a country as USA.